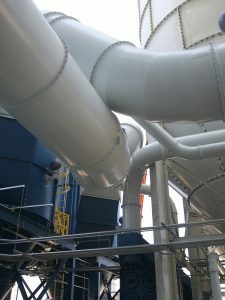 The ductwork of an industrial dust collection system connects the system’s hoods, air cleaning device(s) and fan. Carefully planning the size of the ductwork will assist in reducing waste, reducing costs and improving efficiency. Tapered systems: The velocities are nearly constant as the air flow is merged together and the duct becomes larger. Tapered systems are typically used for dust collection systems. Plenum systems: The velocity is usually lower and generally has a larger size then a tapered system. Plenum systems are typically used for HVAC systems and occasionally used for fume extraction. What exhaust volume is required at each duct collection point? What are the sand, dust and/or particulates being collected? What are the conveying velocity requirements? Calculations for determining the appropriate airflow (Q) are provided in the Industrial Ventilation Manual of Recommended Practice for Design. Air is also required to overcome the resistance of the duct and other parts of the industrial dust collection system. This resistance is referred to as the total system static pressure (SSP). It is also key to consider the minimum conveying velocity, referred to as Transport Velocity, that is required to move the dust with particulates (dust, condensable vapors) without creating build-up, static or other obstacles to the airflow. Learn more about how the velocity varies by dust types by reading Control Costs by Carrying Dust at the Right Speed. What size of material is being transported? Does it have any specific qualities, such as high moisture content, abrasiveness, corrosiveness or combustibility? Upon a final understanding of the exhaust volume, the contaminants being collected and the velocity requirements, sizing the ductwork for an industrial ventilation system can be determined with the Flow Rate Equation Q=VA. IVI’s engineering and design team has years of experience designing and sizing industrial ductwork. IVI can assist in the design of a new system or the redesign of an existing system. 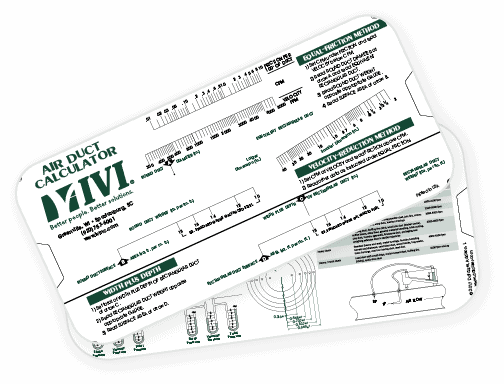 Looking for an air duct calculator? Just complete the contact information below, and we'll send you one FREE!